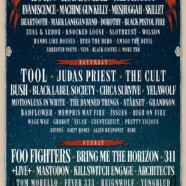 Epicenter Festival – a new 3-day destination music experience from premier independent U.S. music festival producer Danny Wimmer Presents – brings a massive music lineup to its 2019 debut, with over 65 music artists performing on four stages, led by Foo Fighters, Tooland Korn. The inaugural festival takes place in the heart of the Mid-Atlantic region, at the newly created Rockingham Festival Grounds in Richmond County, North Carolina on Friday, May 10, Saturday, May 11 and Sunday, May 12, 2019. Epicenter will also feature sets from Rob Zombie, Judas Priest, Bring Me The Horizon, The Prodigy, The Cult, 311, Evanescence, Bush,+Live+ and dozens more. The expansive Rockingham Festival Grounds, being developed in coordination with Rockingham Dragway, The Rock (Rockingham Speedway), and other local land owners, promise nonstop entertainment, extensive camping options, and no curfew. General Admission, VIP tickets, and hotel and camping packages for Epicenter go on sale Friday, December 14 at Noon ET athttps://epicenterfestival.com. Fans 21+ can enjoy multiple specialty curated beverage experiences. Varietals from Caduceus Cellars & Merkin Vineyards (owned byMaynard James Keenan, co-founder of international recording acts Tool, A Perfect Circle, and Puscifer) will be available at the Caduceus Wine Garden. Experience abounds at the Heavy Tiki Bar (a tropical oasis filled with killer cocktails and shade). Fans can also enjoy a large variety of local and regional brews at the Epicenter Craft Beer Garden. Camping at Epicenter will let patrons keep the rock n’ roll party going all through the weekend and will set this festival apart from other U.S. rock shows. Camping spots are connected to the festival grounds and include perks like access to showers, portable restrooms, food and drink vendors, charging stations, information and medical services, as well as a Thursday night pre-show party. Campers will also have late night access to Rockingham Village, an impressive promenade featuring food, drinks, merch shopping, entertainment, art and activities until 2:00 AM daily. Rockingham Village will be conveniently located immediately in front of the venue, adjacent to the North Premium campgrounds. Camping options will include immersive, Premium Spaces on the North Side of the site as well as free options in the South Side campgrounds. Rockingham Village at Epicenter will be open for extended hours to allow fans to eat, drink, shop and see performing artists before and after the main event. Featured vendors will include festival merchandise, artist merchandise, lockers for rent, lifestyle shopping booths, a full General Store, coffee shop, craft beer at Headbangers Beer Bar, Caduceus wine bar, breakfast vendors for campers, as well as late night food served after the main venue closes. The Village will also have a stage featuring cover bands and Hellzapoppin Circus SideShowperformances throughout the weekend. f.y.e. : f.y.e. will be hosting the ultimate fan and artist interactive experiences throughout the festival. f.y.e. is the only place at the festival to get all your favorite band’s music – and maybe even get to meet your favorite Epicenter performer! Check back for updates on artist meet and greet and autograph signing sessions.